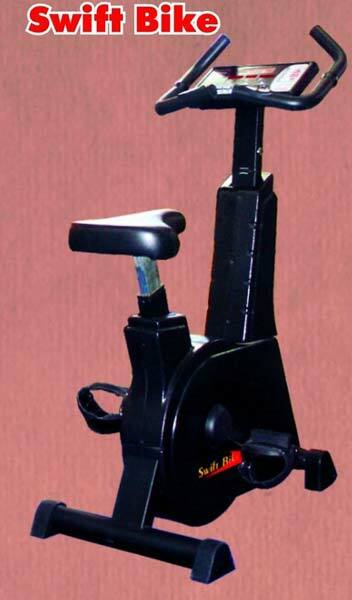 The company stands tall among the successful Manufacturers, Suppliers and Exporters of Cardio Exercise Bikes. The Cardio Exercise Stepper Bike we make available is suitable for a wide range of users from beginners to athletes and cardiac rehabilitating patients. It features optimum durability, impeccable quality, road bike sturdiness and ergonomic design. The Swift Stepper model 1200 & Swift Bike model 1100 Control panel features sleek advanced electronics. Swift Stepper & Bike with electromagnetic resistance, are controlled by a computer which not only displays the graphs of the many functions, but also indicates calorie consumption, power, pulse rate and climbing speed values in real time. The dot matrix display interacts and motivates you to do the workout with ease. The window display helps you track your progress. Pre-work out programs gives you a variety during the week. Swift Stepper has the independent stepping action. Self leveling steps reduces ankle stress. Swift Bike features exceptional durability, road bike sturdiness and ergonomic design that allow the user to choose the perfect position for all type of Cycling. It also provides extra smooth pedaling.Our Bike provides comfort with proper adjustable cushioned seat. Accessory station holds books, towel and water bottle, Mobile etc. Swift Stepper & Bike are also whisper quiet. PFT designed contact heart rate control allow instant monitoring of pulse. Set your target Heart rate and start your workout. Staying in your target heart range is easy with Grip Pulse Sensor. Just grip the bar to read your pulse. PFT has once again redefined a Fitness Product with beautiful design and innovation in the field of fitness. Calories Burned, Mets, RPM, Heart Rate, Speed, Distance, Level, Load / Watts.